A few weeks ago, Lorelei Eurto offreed up to us beaders a new Michael's challenge. She picked out some beads at Michael's Arts and Crafts Store and encouraged us to get the same or similar beads and see what we could make from them. We could add two other bead types, a focal, and/or a clasp if we wanted. I really struggled with this challenge for some reason. I liked all the colors and the unique bead shapes, but had a hard time getting the blue to cooperate with the other colors. I actually kept envisioning mossy-covered structures because of the green beads, but couldn't make that vision translate. (Though I did try dying the ceramic beads with some green alcohol inks.) I finally went through my bead cabinet looking for something, anything that would coordinate with all the beads and bring the colors together. I settled on some tiny violet beads and a plan began to form. Yes, I created a leather wrap bracelet. The larger, ceramic beads fit on the leather nicely and the other beads hung on head pins from the leather. The owl button was a perfect clasp. The bracelet wraps about two times around the wrist. However, I discovered that un-wrapped it works well as a choker also. I want to thank Lorelei for offering up another fun and indeed challenging opportunity. 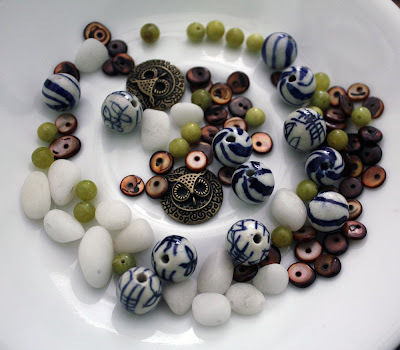 I always enjoy a chance to work with beads that I might not have picked for myself and see what I can design. This was perfect. Don't forget to head over to Lorelei's blog to see what the other participants also created with the ingredients. I absolutely LOVE the addition of lavender with the other beads! Looks great, and I bet this piece feels so good on the wrist! thanks for playing along! Yes you did rock it...it looks like a cherry blossom branch for the arm awesome! Tammie- Ha. I don't feel so clever sometimes, but I guess this one just worked out in my favor. Thanks, dahling! I really love what you came up with. I think it has a great outdoors-in-summer vibe. I'm dreaming of a walk through ancient woods with little pops of colorful flowers here and there. Kelly, Thank you! I guess it's a shame I didn't make this toward the beginning of summer. I kept feeling like it was almost too spring-like with the addition of the lavender. I kept trying to figure out how to add an orange to it, but none of the orange hues I had worked the way I wanted. In the end, I'm really happy with the way this one came out. I'm so happy you like it too! I absolutely adore this. I love how all the beads look on the leather and how it wraps around twice (and works as a choker). It is just awesome! The lavender was a great touch. Very pretty!! I think the leather pulled all together, and I love that it can be worn as a wrap bracelet or a choker. Love, love this! What an awesome piece. 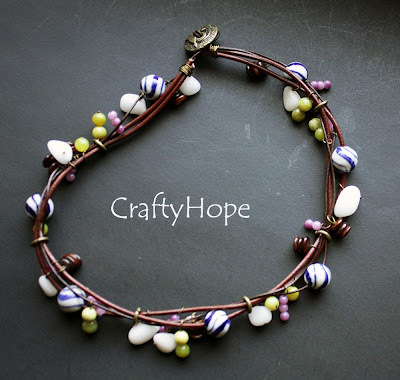 I love what you made and the lavender beads are so great with this! Janet, Thanks so much. I still can't believe I found a color that would work with this palette. Like I said, Lorelei challenged me and I loved it. I'm so glad you took the time to swing by. Thank you. You really made this piece work out great! It is really great looking and seems like one of those bracelets (or necklaces) that would be fun to wear a lot. I love the way that it looks like twisted branches. Very nice! Your design is fantastic! Love that it can be worn as either a bracelet or necklace. 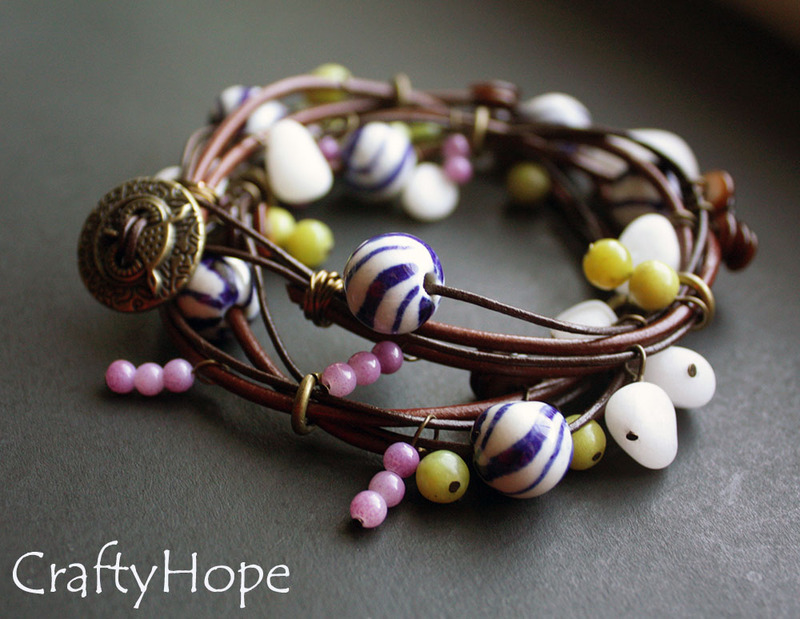 Hope~I would never imagine these beads would go together but you made them play so well together! What a great bracelet/choker! Jewelry with movement is always a plus! Very nicely done. OMG! The lavender addition is brilliant! I would have never thought of that. The bracelet looks so comfortable to wear, yet very stylish and classic. Love it! Hope I like your bracelet lots. I tried using cord in one of my designs because the challenge came from Lorelei but I couldn't make it look right. You did a great job with it. Oh this is gorgeous! I love it. I don't have any leather strapping like that but I do, do, do so love the look!!! Keri Lee, Thanks so much. I actually found that cord at Hobby Lobby just a few days before the reveal because I just knew I needed to try it with those beads she picked out. Fortunately for me, IT WORKED! I appreciate you taking the time to come by. I searched "Michaels Beads" and found your blogspot. The bracelets are gorgeous! Amazing job! Amanda! Wow. . .thanks! I'm surprised at the info and pleased that you like the bracelet. Thank you!